Voted 2nd in the National Comics Awards for Best Indy Comic, ZARJAZ was a sell-out success at the recent Comics Festival in Bristol-- quite literally, as every printed issue was sold-- forcing a hasty reprint. Released simutaneously at the convention, both issues boast complimentary parts of a comprehensive and brand-new exclusive interview with Alan Moore, in which the legendary writer discusses his future projects, his writing methods and what he thinks of certain other creators. 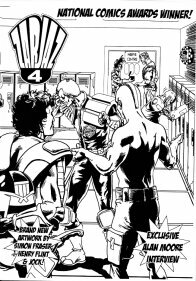 There is the usual mix of new strips written and drawn by up-and-coming creative talents centred on 2000ad characters past and present, Simon Fraser, Jock and Henry Flint contributing to a special tongue-in-cheek Tharg story in issue 4. 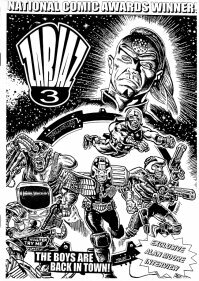 You can now buy your copies of ZARJAZ on-line through Ebay! Just type the phrase ZARJAZ into the item search and from Friday 13 July you can buy copies at £2 a time (plus 70p postage) using Paypal, cheques, POs or cash! Oversees buyers welcome as shipping rates are listed.